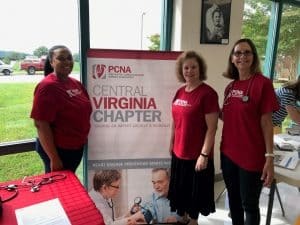 The Central Virginia Chapter of the Preventive Cardiovascular Nursing Association covers the Central Virginia region including Charlottesville, Richmond, Fredericksburg, Culpeper, Waynesboro, Harrisburg, and Lexington. Contact Dana to learn more about getting involved with the Central Virginia Chapter. The Central Virginia PCNA Chapter was started in 2005 by Suzanne Fuhrmeister and Regina Stottlemyer. Members consist of registered nurses, nurse practitioners, registered dietitians, and exercise physiology staff from cardiac rehab, acute care, clinics, university medical centers, private and community hospitals and physician offices. The Central Virginia PCNA Chapter holds four quarterly meetings per year and hosts a PCNA regional meeting or program most years. Our goal is to provide outreach, fellowship, networking, and continuing education opportunities while striving to provide the best care for our cardiac patients and the community.